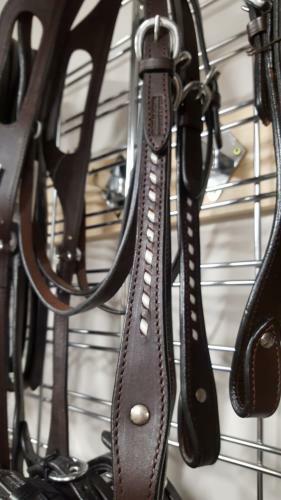 Western one ear bridle with white buckstitching. Leather western bridle - one ear style with white buckstitched feature. Brown leather with buckstitched feature. One ear style bridle (reins not included). Thinner throatlatch strap to accentuate the jaw. Nickle plated horseshoe shaped fittings. Fitzroy is an Australian design made in India.